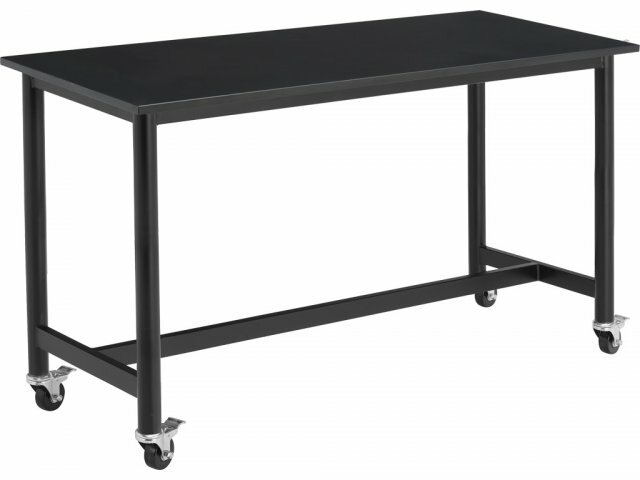 Standing STEM Demonstration Table - Epoxy Top 24x72"
If your students like to work while standing, they will love experimenting at this standing STEM demonstration table. 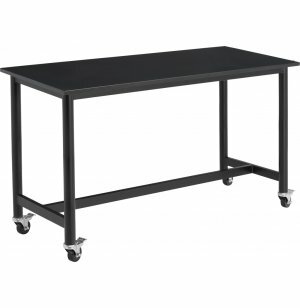 Academia’s STEM Demonstration Tables will support the endless possibilities of your STEM classroom, makerspace, or lab. They come in so many sizes, heights, and work surface options, that any educator can have exactly what they want. With such great choices, you get the perfect configuration to meet the needs of your space, your students, and your experiments. These sturdy STEM demonstration tables will provide the perfect space for years of exploration. Their fully-welded, unitized, 18-gauge steel frames, with 16-gauge steel legs, are incredibly strong. A steel footrest gives your students a comfortable place to put their feet as they work. 18-gauge Steel Apron, 2" x 1"
Solid Epoxy is completely impervious to most harsh chemicals as well as normal laboratory heat. Super Tough: Epoxy work surface can withstand high heat and extreme chemicals, but has limited resistance to low temperatures (dry ice). Comfortable Design: Fully-welded 18-gauge steel footrest supports your students while they work. Supportive Frame: Stands on 16-gauge steel legs, and a unitized, fully-welded, 18-gauge steel frame. Stable Selection: Choose height-adjustable glides or locking casters.